I’ve said it before and I’ll say it again: I love curls! And I love that my one and only daughter has a mop full of locks that puts my “sleek” hair to shame. In my previous ‘tricks for curly chicks‘ posts, I spoke about various ways to maintain that curl. But this time around, I want to show you guys how to do super easy twist out curls, using my current, favorite curly girl product: Aunt Jackie’s. Let’s just say Aunt Jackie’s is to curly chicks what GHD is to straight haired chicks: The bomb dot com! (BTW this is not a sponsored post, I just really love the stuff!) Even with my limited knowledge of curly hair, I knew that I didn’t want my kid to end up looking like the electrocuted version of Tina Turner. Fortunately, my very own curly hair guru, JustEllaBella, saw my pain and introduced me to this wonder product. 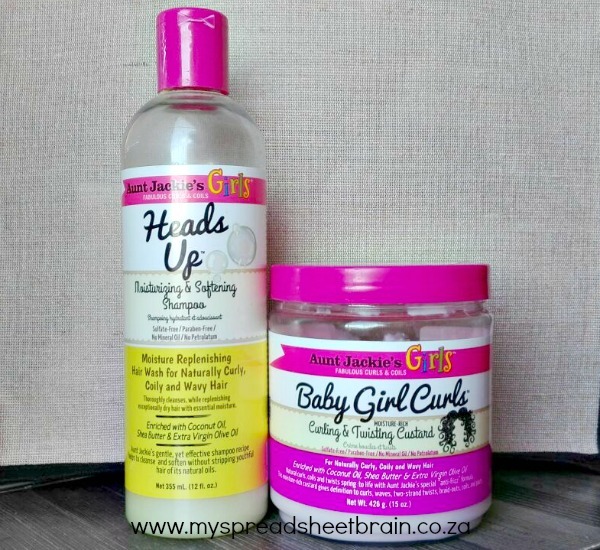 Auntie Jackie’s makes hair care for little girls so easy! It is sulfate-free, paraben-free and has no mineral oil or petrolatum additives. I mean, you could drink the stuff. Well, not really. Please don’t drink it. But it IS super loving towards your hair. I started off by giving her mane a good wash using Aunt Jackie’s Girls ‘Heads Up’ moisturising and softening shampoo. It makes a good amount of foam and smells delish. Oh and most importantly: It doesn’t strip hair of its natural oils yet still gives it a thorough cleanse. Rinse and repeat, and we were good to go! Next, I applied a few dollops of the amazing Aunt Jackie’s ‘Baby Girl Curls’ curling and twisting custard. The thick, creamy formula is enriched with coconut oil, shea butter and extra virgin olive oil. It’s designed to combat that frizz and help give your curls definition. Totally legit! I applied and combed it through her hair. The next step takes a bit of patience (from her side and mine). I popped on some Mickey Mouse (on the TV, not on her hair) and started twisting out strands of her hair. Depending on how full you want the hair to be, you could make the twists thicker or thinner. Once that’s done (it really doesn’t take that long), I simply dry her hair on low heat. As you can see (above) my girl was not keen that I was messing with her Mickey Mouse time. But she soon got over it when she took a glimpse in the mirror! She loves her twist outs! They eventually “untwist”, but that’s okay, because the curl has been formed and the product helps to keep it defined. So, friends, what do you think? Would you give my Aunt Jackie (she’s not really my aunt… or a real person) a try? What is your curly hair regime? Clip note: Moms, I get mine at Clicks! They usually have sweeet 3 for 2 deals, every now and then. So that’s a great time to stock up! The range has a variety of different products, like hair oil and conditioners. But I’ll chat more about those later on. Ooooh must try! Must must must! Especially for Emma! I dunno about those twisty things her hair is so long but worth a try and maybe a blog post lol will see … Thanks for the tips! I’ve been using it for about a month now and it really is amazing! I promise! Your daughter is so cute:) I have curly hair and bought the Aunt Jackie curling custard to try. I want to try using it the way that you did on your daughters hair, her curls look gorg. faanx! Hope it works for you too! 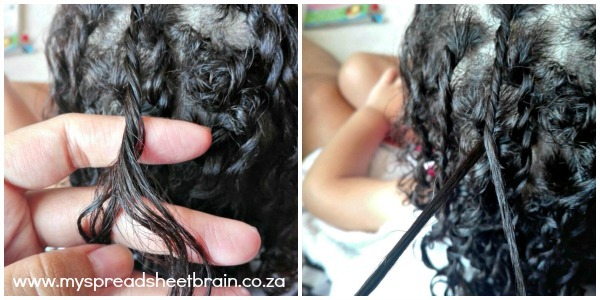 Lol,the look on your little one’s face when her hair was being dried was priceless! !